G3 Torrent is an interesting option for those people that are looking for a free client to download torrent files. This P2P torrent file download application is programmed in Python and has some functions that place it in a distinguished position. With a simple and easy-to-use interface, G3 Torrent is an option that is really worth taking into account. Downloading with G3 Torrent comes along with several options: you can input the URL of the download manually, or you can click on a torrent file link on a website so that the application recognizes it and adds it to the download list. The downloads have the option to be paused, stopped, or even offer us the possibility to be able to change their position in the download queue. As well as all these basic functions, G3 Torrent has other features that make it special. For example, you can create friendly IP addresses, to give priority to those users that you share more affinity with, if they are downloading the same file as you. Another interesting feature is the possibility to choose the priority of the files that are included within the same torrent file. 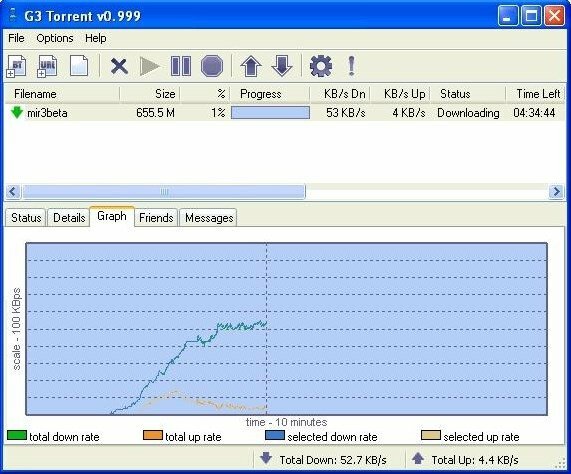 Try out G3 Torrent and discover an efficient way to manage your downloads.